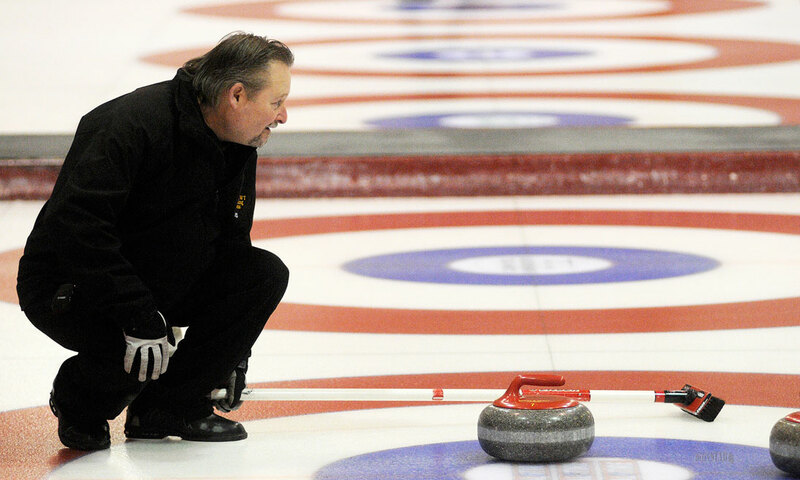 READY TO REPRESENT – Skip George Hilderman sets a target for his teammates during the local men’s playdowns for the 2015 Canadian Masters Curling Championship. George Hilderman is looking forward to holding home-ice advantage at the 2015 Canadian Masters Curling Championship. The 61-year-old Hilderman and his rink of third Gord Zealand, second Clarence Jack and lead Richard Trimble earned the right to represent the Yukon at the 2015 nationals after winning the local playdowns held this weekend at the Whitehorse Curling Club. Hilderman beat Team Young 9-1 and 10-4, and Team Tuton 10-1 and 7-6 in a double-round robin held Saturday and Sunday. The Tuton rink – led by Craig Tuton – beat Team Young 5-4 and 11-1 to finish second. The 2015 Canadian Masters Curling Championship will be hosted at the Whitehorse Curling Club March 29 to April 5. The event sees curlers over 60 battle for the Canadian championship. Last year, Hilderman’s rink finished 2-6 in Coaldale, Alta. “We’re really looking forward to this year’s nationals,” Hilderman said Sunday afternoon. Hilderman skipped the Yukon to five senior nationals and represented the territory at both the seniors and masters championships last season. Hilderman said his rink was “firing on all pistons” for the Yukon playdowns. He and Zealand have worked as a tandem for a while, and their partnership continues to pay dividends. Will Team Hilderman be feeling extra pressure on home ice in March? Skipping the Yukon women’s entry will be Ellen Johnson, 64. Johnson’s rink of third Elaine Sumner, second Ev Pasichnyk and lead Nancy Kowalyshen was the only team to file their registration papers in time for the women’s playdowns. At last year’s national championships, Johnson’s rink finished 0-9. In the case of an uneven draw for the 2015 nationals in Whitehorse, local host teams could be fielded. Those rinks would be skipped by Tuton and Pat Banks, respectively.